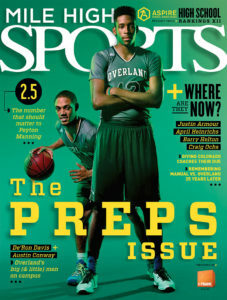 In February 2015, Overland basketball standouts De’Ron Davis and Austin Conway graced the cover of Mile High Sports Magazine. They were the up-and-comers. The next great story for Colorado high school basketball. And there they stood. A couple of kids worried about prom dates were occupying the same space that had housed John Elway, Peyton Manning and Chauncey Billups. A little more than a month removed from their magazine cover debut, Conway and Davis came away with the school’s first boys basketball championship, beating ThunderRidge 55-42. Conway was set to graduate and then head to the University of Wyoming to continue playing basketball. Davis was only a junior. But oh did people know about the 6-foot-8 forward from Aurora. By the time he was a senior, even though he towered over most players, he possessed a fluid game in the post while still having the shooting touch to knock down a 3-pointer when necessary – and that was helpful since he was routinely double- and triple-teamed on the block. Division I coaches were lining up at the chance to get Davis signed to their roster. Indiana’s Tom Crean was the winner. A couple months after choosing to become a Hoosier, Davis and Overland won a second state championship. Countless hours in the gym – from the time they were just little kids – and all of those club team games and practices ultimately resulted in back-to-back state titles for Overland. But it’s quite possible that the public first learned of Conway and Davis with a simple magazine cover. 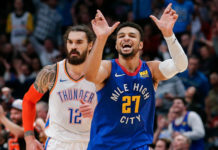 The landscape of high school athletics can be tough to judge at times, but Mile High Sports opted to roll the dice on a dynamic duo that seemed poised for big things. And the gamble paid off – there was no “cover jinx” here. But that’s all in the past. Both players are off doing their thing in college. After one season of sitting the bench for the Cowboys, Conway decided that he needed a change. He began to question if basketball was indeed his true love. 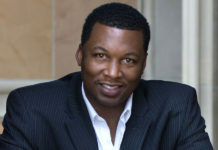 He came to the conclusion that although his greatest high school success came on the hardwood, his college success should be measured on the gridiron. He left the basketball team and strapped on shoulder pads in the fall of 2016. The decision came as no surprise to Davis. He knew that Conway was too much of a competitor to idly sit on a bench. He had to be in the action. That decision has paid off so far. In what would become his freshman season, Conway caught 11 passes for 103 yards. He rushed the ball 17 times for 110 yards and a touchdown. He also netted a special teams touchdown, returning a punt 60 yards against UNLV. The former quarterback also threw a touchdown pass. 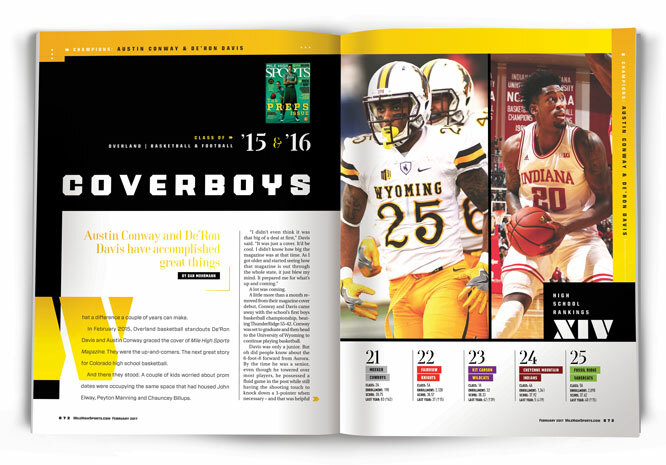 He was a two-sport star in high school and knows that if he continues to put in the work at the collegiate level he can be every bit as successful on the gridiron for the Cowboys as he was for Overland. The same can be said for Davis, who did not redshirt this year. There is little to no doubt that he is going to be a success with the Hoosiers. Through the end of January he was averaging close to 13 minutes per game. In those minutes he’s been able to muster a scoring average of six points per game. He’s grateful for every minute of action that he has seen in his basketball career. It’s led him to places that sometimes seem unreachable in his neck of the woods. It keeps it him grounded. It’s a good reminder for both Conway and Davis of where they came from and the journey that they have shared, even if they’ve ended up in different places. The two remain friends to this day. Conway says he tries to make sure they talk at least once every two weeks. The conversation has just shifted from being teammates and talking about what needs to be done in order to achieve a mutual goal to one of friendship. Now they provide advice and support to each other. And, if needed, they’ll remind each other that in order to compete at the level they want to reach they can’t afford to not give it their all. Time can certainly take its toll on anyone. For these two, they still get to revel in the prime of their athletic careers, but they also have a concrete reminder of a time that was much simpler. Even with serious demeanors on their faces, one look back at that Feb. 2015 magazine cover, and it’s not hard to see a couple of kids just having fun with a rare opportunity. And if there’s any doubt that what readers saw in the issue was anything other than Davis and Conway’s true relationship, take it from the horse’s mouth. The experience is something they’ll never forget. They can’t. They’re too close to each other and it was the start of something special that happened at Overland. Something they helped create. Conway makes sure he keeps an issue close by because of how special it became, especially considering what was accomplished afterwards. Davis has one on display back at his room in Aurora. His life has been filled with accomplishments on a field or a basketball court. 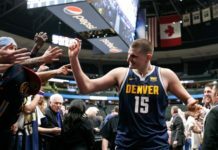 Each of those accomplishments has their own special place and that issue of Mile High Sports Magazine is no different. It should stay with the rest of his pictures and awards. It belongs with the best of them. But unlike everything else in Davis’ room, it’s not a memento of something accomplished. It’s a memento of something that foretold. Going back two years, Conway and Davis can always point at that magazine cover, knowing that those involved believed that they could accomplish great things. They did. And still do.